SoftPlanet makes it possible for everyone to get free CamDVR download directly from our servers. There is no registration needed for downloading. Recent tech developments have made it possible to have security cameras nearly everywhere – at the office, at home, in the yard, etc. While this greatly raises the security level around you it also causes certain problems related to managing all the video information that you will get. Fortunately we can recommend a solution – CamDVR 2.3.0.0. This is a software program that comes with support for an unlimited number of devices and is capable of doing various tasks related to video capturing and managing. It offers an extensive number of features so it will likely meet your needs and perhaps even go beyond them. This is what makes it a valuable app but given this you will also need to get a valid license when the time comes. CamDVR will come with an easy installation process that will not cost you time or effort so you will be ready to go in no time. While this is good there's something else too – the app comes with extensive and advanced functionality too. We cannot list all of it here but at least we will try – CamDVR supports an unlimited number of cameras, various transport protocols, online connectivity, various executable functions and more. Special features include permanent video recording and pre-recorded videos. In a few words this application will allow you to turn your PC into a video managing and recording station saving you the money to purchase one. The interface of CamDVR is completely oriented at managing and working with cameras. It comes with a few drop-down menus and icons in the upper left corner and two major program window panes. The one to the left gives you an overview on the cameras that you have installed while to the right you will see images from the cameras that are working at the moment. There are four tabs at the bottom of the program interface too where you can see program statistics, a list of actions, detector information and program overview. 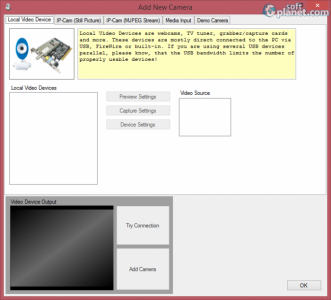 Working with this application starts with adding working cameras to it. You can do that by using one of the drop down menus in the program interface. The rest of the things you must do include setting the cameras up, changing settings here and there in case you need to do so, and watching what your cameras catch. By using the icons in the upper left corner you will be able to turn on or off Camera Preview, Scheduler and Detector. An interesting thing is that this application also comes with a built-in video player and an AVI creator tool. When the time to manage multiple video cameras comes, then you can rely on CamDVR to do the job. This is a small-sized application that can be installed with no effort and once this is done it will treat you with extensive functionality and an easy-to-use interface. CamDVR is not a free application but you can rest assured that your money will be spent on something that is worth it. In case you do not want to hurry then you are more than welcome to try the trial version of this software utility. Our security scan shows that CamDVR is clean from viruses. 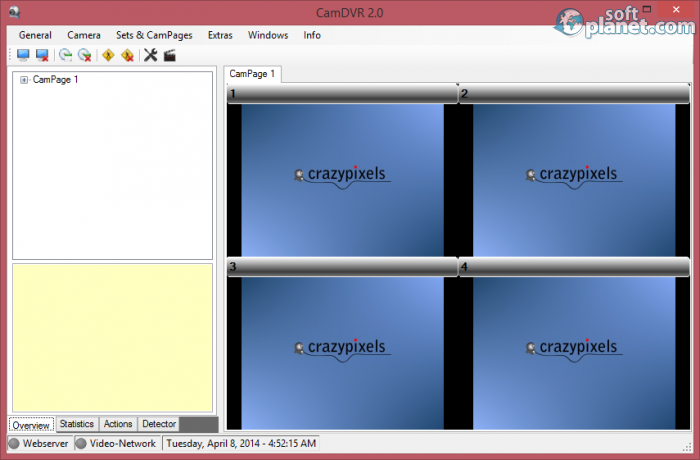 The current version of CamDVR has been scanned by our system, which contains 46 different anti-virus algorithms. That ensures that CamDVR 2.3.0.0 is 100% safe for your computer.